The Watchtower magazine turned a lot of heads when it wrote that apostates of Jehovah’s Witnesses are “mentally diseased.” We ex-Witnesses have sure taken notice. So have authorities in the U.K. This brings up a few issues. First, was the Society saying that all ex-Witnesses are mentally diseased? Second, is this a new level of exxer-bashing for the Society, or just a new turn of phrase? And finally, is this really worth the charge of hate speech or are people just blowing the whole thing out of proportion? I’m sure many Jehovah’s Witnesses feel that this is the case. Does This Mean That The Society Thinks All ex-Jehovah’s Witnesses Are Mentally Diseased? Technically, yes. Or no. Well, most of us probably are. It depends. When you look up the word “apostasy” in the Society’s encyclopedic Insight on the Scriptures Vol I, you’ll find that lots of things could make you guilty of apostasy. Lack of faith in God or the organization are both listed as reasons you might be an apostate. Also note that while this entry says that apostates often seek to make others their followers, it isn’t listed as an actual requirement. It’s just one of several possible symptoms of apostasy. Here’s another line from the beginning of the Insight entry that encourages us to think that all ex-Witnesses are basically considered apostates. However, in the Christian Greek Scriptures [the Greek term for apostasy is] used primarily with regard to religious defection; a withdrawal or abandonment of the true cause, worship, and service of God, and hence an abandonment of what one has previously professed and a total desertion of principles or faith. 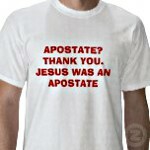 Again, it would seem that simply leaving the “true” faith is enough for the word “apostate” to apply. Hence, all ex-Witnesses can be seen as apostates here. Still, the authors of the Insight Book do acknowledge…however generously, I’m sure…that there is a difference of degrees. It is evident that there is a distinction between a ‘falling’ due to weakness and the ‘falling away’ that constitutes apostasy. The latter implies a definite and willful withdrawal from the path of righteousness. (1Jo 3:4-8; 5:16, 17) Whatever its apparent basis, whether intellectual, moral, or spiritual, it constitutes a rebellion against God and a rejection of his Word of truth.—2Th 2:3, 4; see MAN OF LAWLESSNESS. So there is a little wriggle room here, but not much. The entry above doesn’t say what a falling away due to “weakness” actually means. I suspect those of us who fall away due to weakness are 1) those who still believe, but who are inactive 2) those who are totally submissive to Witness interventions and who never utter any objections to the Society’s teachings or policies. I think many ex-Witnesses may fall into the second category when we first choose to leave our former Kingdom Halls. I know lots of exxers who are troubled by their inability to express their objections when they’re being grilled by angry Witnesses in their own homes. But few of us will remain this way forever, especially after we’ve face numerous interventions by overzealous believers. You can only beat a plowshare so many times before it becomes a sword, ya know! For now, I think we can interpret this as applying to all ex-Witnesses who don’t believe the Society is the “true religion” anymore, though some of us are more black hearted and vile than others. It clearly applies to all ex-Witnesses who have lost faith in the Society, especially those who openly express their reasons for doing so…er, I meant it especially applies to evil, lie spewing apostates who have to file down their demon horns every morning so we can comb our hair. Yeah, that’s the one. Is This A New Low For The Society, Or Have They Been Demonizing Us Like This All Along? No, it’s not such a new thing. Yes, they’ve said other things that are just as bad. Apostates have already been accused of everything from “being one with the antichrist” (as quoted from the Insight Book earlier) to having simply been stumbled by their own pride. But most of these comments weren’t made during the age of the internet. The “mentally diseased” remark was. Note to governing body of Jehovah’s Witnesses: name calling isn’t a good way to reach across the aisle, guys. Just sayin’. Real mature, too. I’m sure Jesus would be proud. I’d like to note something here. It seems that there are two kinds of ex-Witnesses in the minds of the Society. Vile, evil ones who dare speak out. And then there’s the crazy, mixed up kids who just need someone to straighten them out for their own good. I’ve yet to see the Society acknowledge that a third category might exist. Like ex-Witnesses who just disagree with their teachings, behavior, and/or policies for perfectly decent and understandable reasons. Yet this represents the vast majority of us. Let me put it another way. When has the Society every said something like the following statement of even one of its critics? I would find it encouraging if such a reference could be found. But I don’t know of even one. Is The “Mentally Diseased” Comment Really Worth All The Excitement? Well, being a party pooper, I do try to be fair to the Society and Jehovah’s Witnesses, even if they don’t always think I am. (Can’t please everybody, man…) So I feel I should point out something which only diminishes the impact of the Society’s comment a tiny-winy little bit. When I read the article, I didn’t get the sense that the author was a bitter old man standing on a soap box with a bull horn, shouting, “Mentally diseased!” at us while he shook his withered fist. Instead, it struck me as just another ill-conceived attempt at one of the Society’s infamous analogies. Basically, the author was trying to compare the spread of non-Watchtower approved ideas and attitudes with the spread of a disease. Since teachings are…well, mental things…the author put the obvious word with the other obvious word. And voila! Here I am writing this article about their article. So maybe it’s not so bad. Or is it? Okay, this is just my interpretation, but it seems as if the line “mentally diseased” was dropped in the sentence without much thought. It’s as if accusing those who happen to think you’re religion is wrong of being “mentally diseased” is no big deal and not worth much excitement within the organization. It’s as if everyone reading it pretty much already assumed that was the case anyway, so it never occurred to the writing committee or the governing body that someone “worldly” might be shocked or offended by it. In other words, it’s as if accusing former Witnesses of being “mentally diseased” or “one with the antichrist” is just business as usual for the Society’s leaders and writing staff. Unfortunately, based on our own experiences and an ocean of literature that goes back for several decades, I think we exxers have to admit that it kinda is. You’re mileage may vary. But never let it be said that the Society is as nice to others as it expects others to be of it. The Society is quick to attack it’s critics and relentless to bash those who leave it’s borders. It would seem that the Society’s leaders think this is the Christian way to be. Guys of the governing body, seriously…all this paranoia and fear isn’t doing you or your followers any good. You live in a world of fear and rigid dogma. Maybe it’s time to try a new approach. Maybe it’s time to learn from your mistakes. Maybe it’s time you finally stopped chasing your own tails and started to grow. 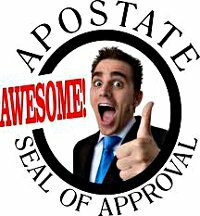 Tagged apostate, Ex-Witnesses, Exxer, Exxers, Jehovah's Witnesses, mentally diseased, religion, Watchtower, Watchtower Society, XJW. Bookmark the permalink. Hey! Just want you to know that while I am not an atheist, I AM an EX JW, and, when I saw your “logo” of Keanu Reeves doctored up, I knew you were a kindred spirit! That being said, I also enjoy your articles, although, you do need to spell check……….I was going to link to FB and was kinda embarrassed to see the word “weeped” used instead of “wept”. Could you correct that? Keep on keepin’ on! Never even noticed that. Thanks. The term “Mentally Diseased” is actually taken from the bible itself. 1 Tim in fact…Not sure why you are all going crazy about it, it has been in the original greek a long while! I am aware that the term “mentally diseased” is taken from the NWT. So what? The fact that you think this matters or excuses anything suggests, to me at least, that you haven’t really thought this through. If I wrote an article that said that all JWs were morons or accused you of being a loon because you’re a JW, I don’t think you’d care if I put the term in quotes or if I had borrowed the exact wording from another source. It would be just as insulting, and unless I made it clear that I disagreed with the statement, you would assume that I agreed with the insult. The fact that I borrowed the wording from another source wouldn’t matter, especially if I agree with the sentiment. I don’t think you’d see it the same way. I don’t even think you should see it the same way because my attempt to shift the blame would be a cop out, plain and simple. The reality is, whether I’m borrowing another persons words to express the thought or not, I just insulted you. The Society accusing apostates of being “mentally diseased” is no different. To me, that’s actually quite obvious and not hard at all to understand. Just curious, did you actually read the article? Or even the one after it, which was about a related topic? In any event, I really don’t see why this is confusing to anyone. It seems very simple to me. Iam sorry for responding at such later time. I wondererd into this chat. Excuse me..I tend to wander with thoughts aswell. So if i ramble, bear with me. Now my thoughts on the perpectives from JWs and fellow “ex witnesses “falling away due to weakness qoute. I believe what the society was sayin was that those who were weak spiritually whether a new student or exprienced student who may have compromised their spiritual balance by leaning towards immoral conducts that hinder their steps onto recieving full spiritual understanding…So many pick on the Society for their reasons. All there objective is to maintain the puriety of true spirituality. You and others may differ on what may be deemed true religon but none the less the Society has takin on the responcibility of preserving this in a world or Era in where religon may soon be absolete. Unprofitingbfrom it unlike other religious services prospering from it in full veiw of the media, true?. I say that to say this,, living outside the box Jws have constructed for us (ex witnesses:)) i’ve come to see how the world treats those trying to make a difference for the better. Check history. How could someone bring a case or complaint against the meek one whos trying to teach other in the ways in which u should walk? …in also the case of the Society saying mentally diseased? It was a little harsh since they didnt seperate the true apostates from apostates as a collective group like myself whos learning to strenghten my “thinkin abilities in order to dig for the truth as if for fine treasures and discern wat is true and a lie. But the Society are Not prophets but messengers continuing on to spread a messageof what we belive or might have belived to be Truth to those willing to except it, true? Last, to a empathetic defence of wat seems to be the Truth,, Imagine a school..classroom full of honest students and a single well educated teacher. During a lesson one student imposes a question thats relevent but would require attention at later time because of the class being actively in study now. So the teacher postpones further inquiry until later. But the student believes that the teacher is not as knowledgable as he is held to be. So student goes on internet and school newsletters to expose this notion. Its simular to the Governing body in the Society. With outspoken students who seek to slander or defame the name of the school and the administrative staff thats seekin to further the education of such ones. Apostate! Whereas you have the students who stay afterschool for private studies to learn what they inquired about. Now in between you have those torn between what theyve learned and what they want to do with their lives after their mature educations. How do you seperate those ones from the Falling or Failing students? ..apostate detention or apostate expulsion?? The Society is very aware of Satan and his machination. So they are forced to protect the flock or student body by any means within spiritual reasoning. …..pause. Jamel, sorry, but I think that English isn’t your first language. Either that, or you’re messing with me here. Your post was almost unreadable. You also seem to be more interested in converts than you are in commenting on the actual article above. These are not good ways to begin a dialogue, Jamel. Still, what I could make out was pretty familiar WT stuff. This is what every isolationist sect that is generally deemed to be odd, fear mongering, or otherwise “out there” likes to say. For me, it remains as completely unconvincing as it is creepy cult-like. Have you ever noticed that anyone who doesn’t think the way the Society wants them to is presumed to be screwed up somehow? It never occurs to the Society’s leaders, or many Witnesses, that it might be the other way around. This is conveniently deemed to be worldly or apostate thinking by the Society. I consider it the mark of an earnest quest for knowledge and a sign of humility. Thanks, Jamel, but I’ve been there and done that. I’m still very glad I did. Selma recalls a lesson she learned from the Witness who studied with her. “On one particular day,” says Selma, “I didn’t want to have a Bible study. The night before, Steve had hit me as I had tried to prove a point, and I was feeling sad and sorry for myself...But the sister made me think differently by asking, ‘How many of those acts of love do you show toward your husband?’ My answer was, ‘None, for he is so difficult to live with.’ The sister softly said, ‘Selma, who is trying to be a Christian here? You or Steve?’ Realizing that I needed to adjust my thinking, I prayed to Jehovah to help me be more loving toward Steve. Slowly, things started to change.” After 17 years, Steve accepted the truth.